Can’t Get To Class – Class Comes To You! I’m so excited about my upcoming classes these next few months – I always try to plan at least 3 months at a time, so everyone can plan ahead, and fill their calendars. Of course, I know that not everyone can attend on the dates/times that I book; sometimes it just doesn’t fit in with your schedule, or perhaps you just live too far away from me, to attend in person. Well – that’s why I’ve started my classes that will come to you – my Stamp/Bundle of the Month Club! It’s a Club that doesn’t require any long-term commitments – each month I select a stamp set or Bundle to feature, and create a ‘class’ around that stamp set/bundle. You purchase the months that you want – and skip the ones you don’t want! No fuss, no penalty – no problem! For January I’m featuring one of my favourite Bundles from the new Occasions catalogue – the Dragonfly Dreams Bundle. I just love that this bundle is so versatile; you can dress it up with die cuts and layers, or you can do simple one layer stamping. 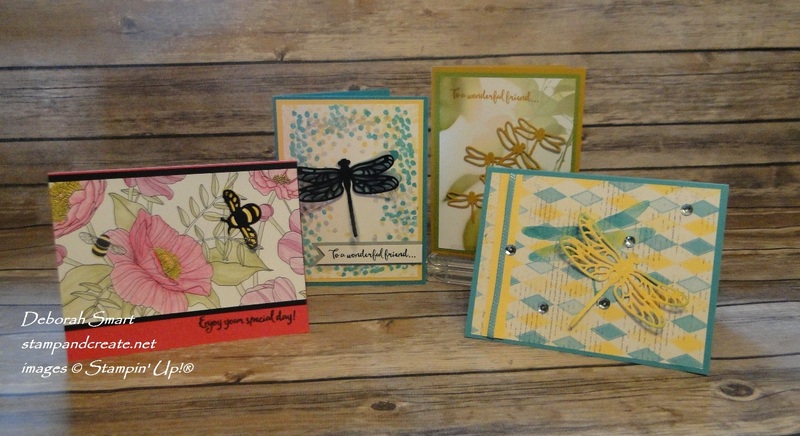 When you purchase this month’s Bundle of the Month, you’ll be receiving the Dragonfly Dreams stamp set and the Detailed Dragonfly Thinlits Dies as a bundle – the Dragonfly Dreams Bundle (item #144728). AND you will receive printed (in with your kit) and PDF (emailed to you) step-by-step instructions on how to put your cards together – at no extra cost! AND you’ll be added as a Member of my EXCLUSIVE STAMP/BUNDLE OF THE MONTH FACEBOOK PAGE, where I will share more creative ideas & projects for using this awesome Bundle – at no extra cost! The only product you’ll need to complete the cards is your own inks, Watercolour Pencils or Markers, Wink of Stella Pen, and adhesives! And if you don’t have those, you can order them at the same time as you order your Bundle of the Month. The total cost to you is only $83 – AND you INSTANTLY QUALIFY FOR 1 FREE SALE-A-BRATION PRODUCT OF YOUR CHOICE!! TO ORDER YOUR JANUARY BUNDLE OF THE MONTH – simply email me at debsmart@shaw.ca, and I will send you an invoice. You can either pay by PayPal, or by e-transfer, whichever you prefer. 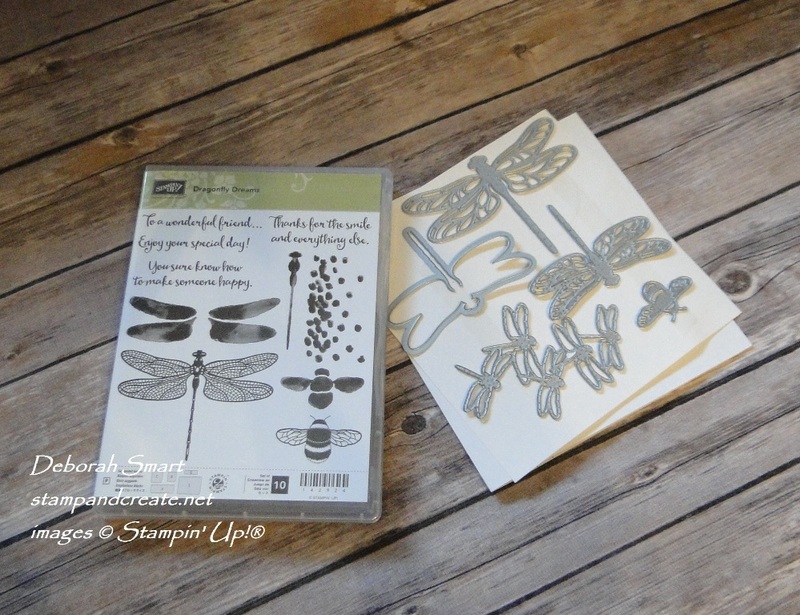 Your Dragonfly Dreams Bundle will come direct to you from Stampin’ Up!, and I will priority post your Kit, with instructions, to you by mail. I will also email you the PDF instructions, to the email you specify. THERE’S ONLY 10 DAYS LEFT before I close off this month’s bundle – then I’ll be offering a new stamp set/bundle for February! Get your order in NOW, so you don’t miss out! Here’s hoping to see you ‘at class’! Next Next post: A New Paper Craft Crew Sketch Challenge! Got Your Eastern Palace Bundle Yet?